Looking for quick and easy morning sickness remedies that actually work to relieve early pregnancy symptoms? There are natural remedies for morning sickness that you can try. You don’t have to keep suffering through all day morning sickness. These tips on how to stop morning sickness in early pregnancy can help. Morning sickness is very common in early pregnancy and can cause loss of appetite, headaches, nausea, and vomiting. You may even experience morning sickness all day. Many pregnant women even have morning sickness at night! However, if you are in your first trimester, this is totally normal! Morning sickness feels somewhat like getting the flu, if you have never experienced it before. Body aches, nausea and vomiting are the most common complaints in early pregnancy. You may even feel like you have food poisoning. The good thing is that usually morning sickness ends on its own around 12 weeks of pregnancy. 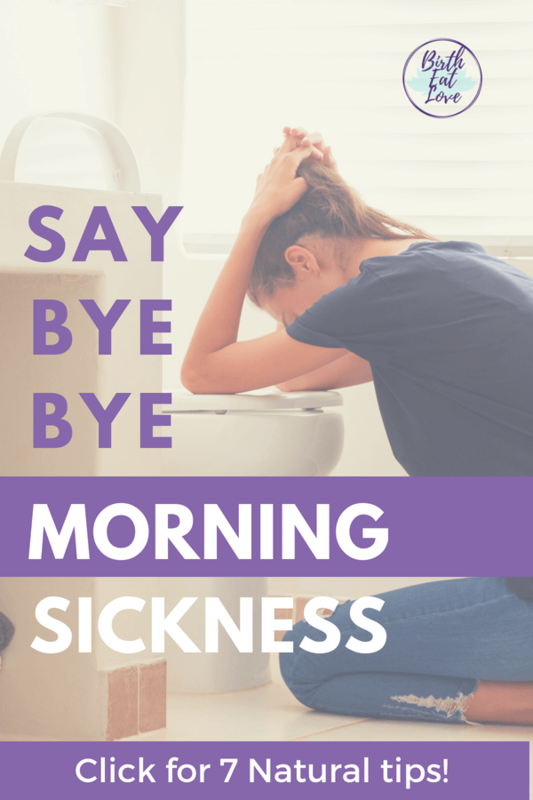 But the truth is, you don’t have to suffer through morning sickness! There are a few things you can do right now to naturally relieve the nausea and vomiting of pregnancy. After suffering through morning sickness with my first 3 pregnancies, I knew when I got pregnant with my 4th that I would have to do something different. How could I take care of 3 kids and my daily responsibilities while having morning sickness all day? I was determined to figure out a way to thrive and feel my best during the first trimester and take care of everything on my plate too. I searched google and my favorite natural health websites until I came up with a plan of action. What I share with you below is the morning sickness remedies that worked for me to relieve morning sickness symptoms. 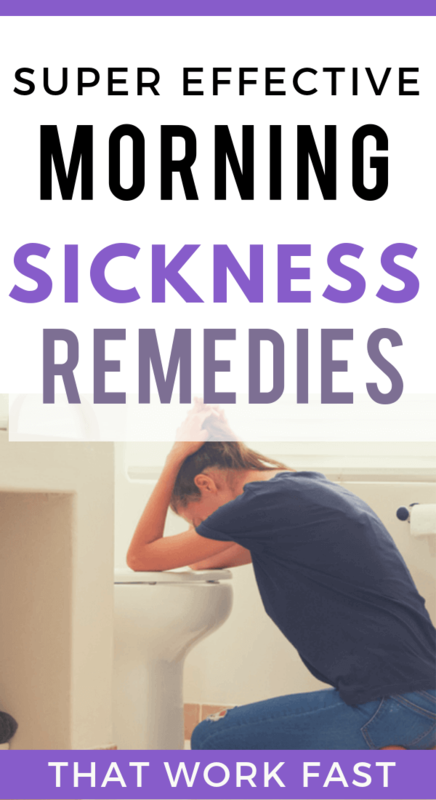 I am going to tell you, I was honestly surprised at how well these natural remedies for morning sickness worked to relieve nausea. I went from barely able to get up in the morning and struggling with feelings of nausea all day, to feeling energetic and relatively normal (considering that I was growing a tiny human). The best part – I was able to keep up with my 3 kids for the most part, rather than being miserable all the time. 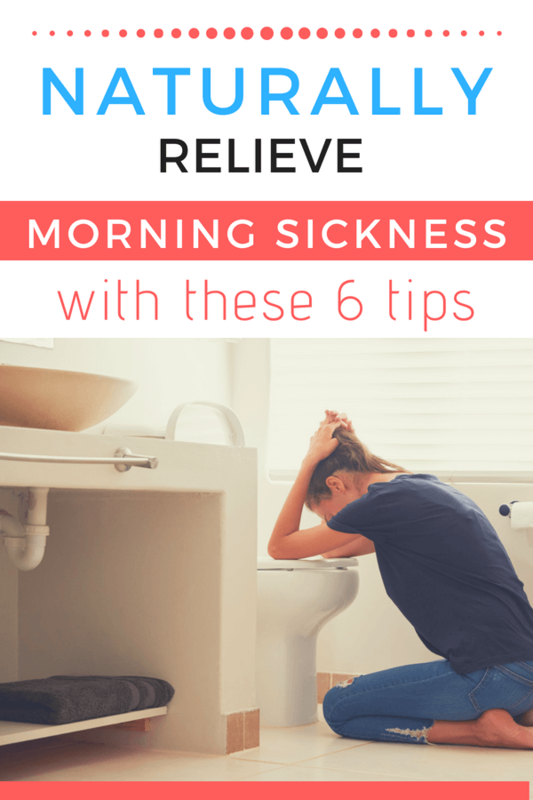 Ready for morning sickness relief tips that work? Disclaimer: The content shared in this post and on this site is meant for informational purposes only and should not replace medical advice. Please seek the advice of your care giver when making decisions regarding your pregnancy. Watch the video for a quick overview of the tips below. Did you know that the health of your gut can impact not only your overall health but that of your growing baby too? I didn’t know anything about this until my 4th pregnancy, but there is a growing base of research showing the link between a mother’s gut health and her baby and how that can impact future health. Adding in foods that support a healthy gut during pregnancy is beneficial for both you and baby and it’s my #1 tip for getting morning sickness relief. Fermented foods like yogurt, saurkraut, kefir, kombucha and kimchi can help to boost your gut flora. Taking a prenatal vitamin that contain probiotics like this one is also a good way to boost your gut health. I personally found sipping ginger flavored kombucha amazing for settling my stomach when I had morning sickness! Kombucha contains vitamins b6, b2 and b1, which are shown to help with morning sickness (source). Also, I found yogurt and sauerkraut foods that I could eat during the 1st trimester. I would eat the plain, full -fat yogurt topped with fresh berries, chia, hemp and flax seeds in the morning and in the evening before going to bed. I would eat about ¼ cup of sauerkraut with lunch and dinner. Are you eating any of these?? I find boosting gut flora stimulates your appetite, or at least relieves the morning sickness for periods, so that you can eat, even if it is just small amounts. While you may have no appetite, you have to eat a little something to sustain yourself. A good rule is to never go with an empty stomach. Having an empty stomach can actually worsen nausea. This is a good time to start thinking about what to eat during pregnancy and when to eat. Figuring out what to eat during pregnancy was one of my biggest challenges the first few times. Once you learn a few basic principles of nourishing your pregnant body it becomes much easier! Eat a handful of nuts (almonds) in the morning before you get out of bed. The key here is to get carbs + fats + protein in the morning. Once you get that first meal down its easier the rest of the day. Make sure to sign up for the Birth Eat Love email list below so that you can get a free PDF with 17 of the best foods to eat during pregnancy to nourish your body and baby! Magnesium plays a large role in how we feel during pregnancy. I highly recommend taking Epsom salt baths. It’s relaxing, actually lowers your blood pressure, and also is a good source of magnesium. This helped me tremendously. If you are unable to eat, try adding Epsom salt to your bath for a few days and see if it helps. If you aren’t a bath person there are lotions like this one that you can use. Ginger is your best friend in early pregnancy. Start your day with ginger tea with fresh lemon juice and honey. Ginger is great for treating nausea. It soothes the stomach and reduces inflammation. Its is one of the best teas for morning sickness relief. Eat fresh ginger in baked goods, in oatmeal, mixed in soups and dinner recipes. Ginger tummy drops like these are also really great to relieve nausea associated with morning sickness. Herbal tea not only can help settle your stomach, but it can also help you stay hydrated and provide much needed nourishment. Sip pregnancy tea like this one I love or nettle tea throughout the 1st trimester to help relieve morning sickness naturally. What is the best tea for morning sickness? These teas are caffeine free, pregnancy safe teas that can help reduce the feeling of nausea during pregnancy. Read my post on the best herbal teas for pregnancy and postpartum here for more ideas on harnessing the power of herbs during pregnancy. I know that may sound silly, but its really helps. An affirmation I love for early pregnancy is “This may be hard, but I can do it!” Reassure yourself constantly. This is just a phase and it will pass. 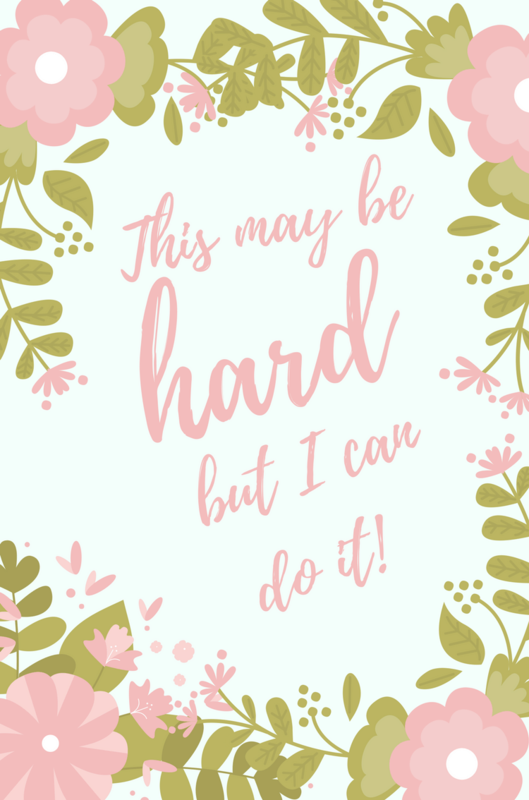 You are strong enough and can do this whole pregnancy, motherhood thing. Remember this is a natural part of pregnancy and you will overcome it and be stronger for it. Need some inspiration? Check out my Pinterest Board with 1000+ birth and pregnancy affirmations! 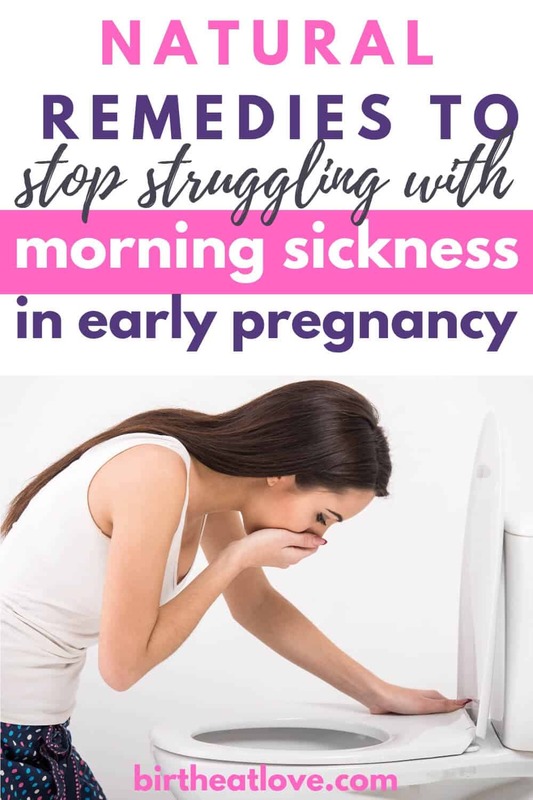 These are just a few simple morning sickness remedies and tips that you can try to relieve morning sickness naturally during pregnancy. Tried everything and still suffering with morning sickness? Struggling with Hyperemesis Gravidarum? Check out these books for a holistic approach. Read the full review of Real Food for Pregnancy Here! 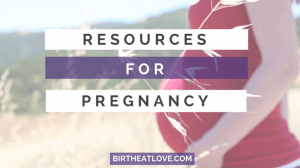 How to start a healthy pregnancy routine – so that you can not just survive pregnancy, but thrive. Found these tips helpful? Save this post for later! Click the Pinterest button to see additional images to pin! If you try any of these tips and they work for you, please comment below! What worked to relieve your morning sickness? We would love to hear about your success with relieving morning sickness! Healthy Pregnancy advice, first time mom, morning sickness, pregnancy, pregnancy diet, pregnancy tips. permalink. Thanks for your comment! I’m so glad that you found a natural remedy that worked for you Angela! That tea contains peppermint which is also very good for morning sickness! I have LOVED this post! It was very different from all of the other morning sickness posts I’ve read. I’m currently struggling with chasing 2 kids while pregnant with my third, so I’m really excited to try out these tips. Thanks! Thank you so much Aubree! I hope some of the tips help! Keep reassuring yourself, it’s hard being pregnant and have little ones, but you can do it! Best wishes!